On 20th November, 1952, a Polish immigrant by the name of George Adamski and six of his friends made an expedition to look for UFOs in the Mojave desert in California, USA. Shortly after having lunch, as the group scanned the sky for activity, a gigantic cigar-shaped craft glided into view. Hoping to get closer as well as a better spot for pictures, Adamski and two of his friends set off deeper into the desert. Adamski managed to take several photos through his tripod-mounted portable telescope, and wandered alone trying to get clearer shots. Before long the silent silver craft rose up into the sky and rocketed into space, but this was not the end of the encounter. A few minutes later another, smaller craft appeared, and glided between two mountains which were ahead of Adamski. As he watched he noticed what he thought was a man beckoning him from about 400 metres away. But as he was about to find out, this was no ordinary man. ‘The beauty of his form surpassed anything I had ever seen,’ Adamski later recalled. The humanoid figure stood at approximately 1.6 metres tall, with long blond hair and smooth tanned skin. He was wearing a brown one-piece suit with a broad belt, and red shoes. The being was also witnessed by his friends who were standing a few hundred metres away. Adamski motioned to shake hands with the being. Palm-to-palm contact was made, and they both began to communicated with each other by using telepathy and sign language. The visitor indicated that he was from Venus, and his name was Orthon. He came with a message to warn humankind of the dangers of nuclear energy and pollution. He also expressed a belief in God and claimed that he and his fellow Venusians lived a pure and spiritual life. After refusing to be photographed, he stepped into his craft and floated into space. The first contact had been made. This was not, however, George Adamski’s first encounter with the alien world. He claimed that he had seen a ‘dirigible-shaped mother ship’ over his Californian house on 9th October, 1946, that’s nine months before Kenneth Arnold’s legendary flying saucer sighting. George was born in Poland on 17th April, 1891, and he and his family emigrated to New York two years later. From 1913 to 1916, Adamski served with the US Army in the 13th US Cavalry, K-Troop. In 1918 he worked as a painter and decorator for the government at Yellowstone National Park. He also served with the National Guard, stationed at Portland, Oregon, and received an honorable discharge in 1919. It is believed that Adamski operated as a successful bootlegger during the Prohibition era (1920-1933). In 1926 he settled at Laguna, California, and began lecturing on oriental philosophy, even though he had no formal training. In 1940 he moved to Valley Centre, California, and became increasingly mystical, establishing a cult movement known as the Royal Order Of Tibet, and adopting many self-appointed titles such as ‘Professor’ and ‘Philosopher’. Adamski and his cult followers finally settled on the southern slopes of Mount Palomar, which is famous for its peak and astronomical observatory. This was the beginning of the time where Adamski would be known as the world’s first alien contactee. As Adamski’s lectures became more frequent, and his cult following grew, so too did his alien encounters. He would claim of journeys to the Moon, Mars and Venus. Often newspapers would report on Adamski and his amazing photographs of craft taken with his telescope.When he published his first book entitled ‘Flying Saucers Have Landed’, in 1953, it became a bestseller and enabled him to widen his field. 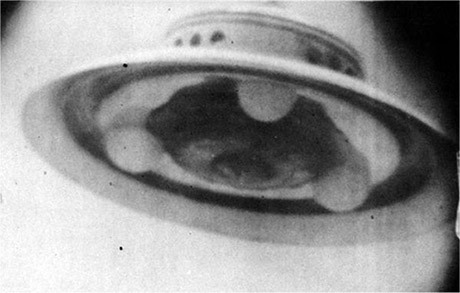 In his second book ‘Inside The Flying Saucers’, he was able to describe his experiences on board the Venusian craft. He recounted his travels in space, and described the yet-to-be-explore Moon. Lunar citizens ‘strolled down the sidewalks’ in lunar cities, he reported, and forests, lakes and snow covered mountains adorned the lunar surface. Despite overwhelming evidence that his planetary excursions were delusions of the mind, Adamski continued to fascinate people in high places. Queen Juliana of the Netherlands even received him at her palace , and Pope John XXIII, who was dying of cancer at the time, allegedly permitted a private audience with him on 31st May, 1963. His mission was to deliver an important package, which he received from the space people in Copenhagen. This claim of course has been denounced by the Vatican, but circumstantial evidence suggests that such a meeting did take place. He traveled to the Vatican with two of his coworkers, May Morlet and Louise (Lou) Zinsstag. Both witnesses say that he entered the Vatican by a side entrance (explaining why there would be no records of his visit) and stayed for an hour. When he entered the room, Adamski claims the Pope smiled and said ‘I have been expecting you’ and when George handed him the package, the Pope replied ‘That is what I have been waiting for’. The Pope’s last words before Adamski left were, ‘My son, don’t worry, we will make it’. During lunch that same day, Adamski took out of his pocket a small plastic wallet, which was lilac in colour. ‘It bore the most singular inscription I have ever seen’ said Lou,’The written characters were of a very unusual kind, certainly neither Roman nor Gothic, nor were they Russian, Chinese, Japanese, Arabic or Hebrew’. Underneath the text was the date of the interview-31st May 1963-written in Roman letters. Inside this little wallet was the most beautiful golden coin with the Pope’s head in profile on it. As they discovered later, this was a new ecumenical coin, ready for sale but not yet on the market, owing to the Pope’s recent illness. They also found out that it cost between 300 and 400 swiss francs. The pope died two days later. He wrote a third book called ‘Flying Saucer Farewell’ which was published in 1961, but by then , cracks were starting to show in his story. In 1959, the Soviet Luna 3 probe had brought back detailed photographs of the lunar surface, showing nothing but rocks, craters and dust. When asked to comment, Adamski claimed that the Russians had retouched the photographs to fool the US. Adamski’s report of seeing ‘billions and billions of fireflies…. flickering everywhere’, when he visited the darkside of the Moon on one of the Venusian craft, however, was backed up eight years later, when US astronaut John Glen returned from a space flight reporting the very same ‘fireflies’. 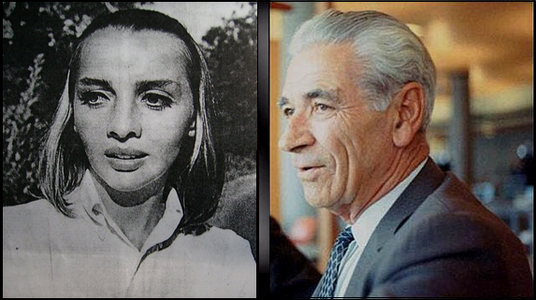 On 26th February 1965, while Adamski was staying at Silver Spring, Colorado, he and a friend, Madeleine Rodeffer, witnessed another scout ship. Fortunately, Adamski’s ‘space brothers’ had told him to have a cine camera ready and he caught the craft on film. William T. Sherwood, an optical physicist and former project development leader for Eastman-Kodak, spent a great deal of time analyzing this footage. His conclusions were that there were no signs of duplicity, and determined that the object was approximately 8 metres across. 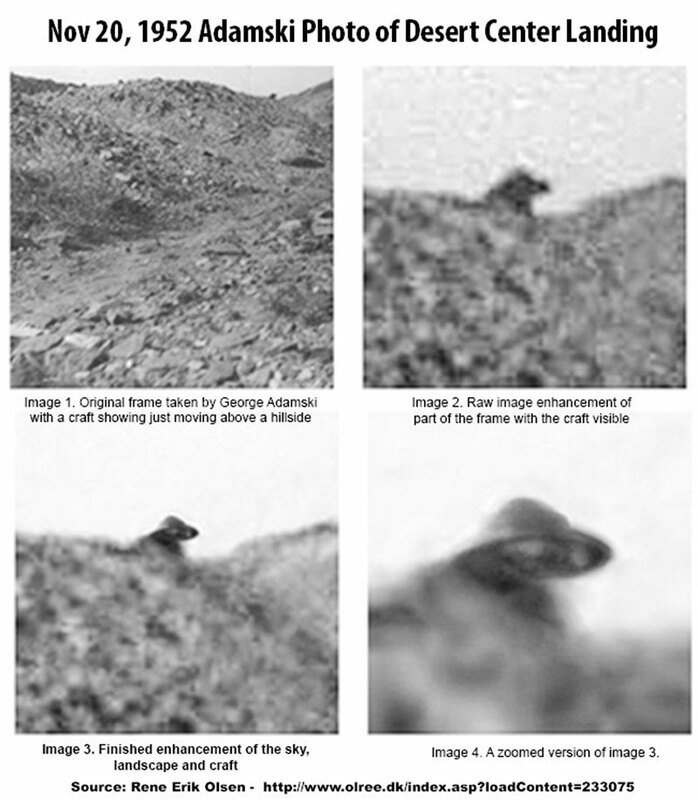 Analysts are still at a loss to explain how or why the craft distorts from frame to frame. Veteran aeronautics engineer Leonard Cramp suggests this was caused by a powerful gravitational field produced by the craft. Unfortunately every copy of the film has been stolen, so we may never know the answer.